Position: full sun or partial shadeSoil: any soilRate of growth: average to fastFlowering period: March to AprilHardiness: fully hardyCommonly known as elephant’s ears, because of their large, leathery, oval leaves, bergenias have become fashionable again. This is thanks to the number of new cultivars that have become widely available and to their usefulness in the garden. Bergenias are low maintenance, evergreen, will grow in sun or shade and tolerate a wide range of soils, including dry soils and clay. This variety has deep pink flowers in early spring and after it has been hit by a hard frost in autumn, the foliage will turn an attractive shade of red and remain that way until the temperatures start to rise again. Garden care: After flowering remove faded flowerheads. Cut off damaged foliage in spring. Lift and divide large clumps in early spring. Position: full sunSoil: fertile, well-drained soilRate of growth: averageUltimate size on M27 rootstock: 1.8 x 18m (6ft x 6ft)Ultimate size on M26 rootstock: 3 x 3m (10 x 10ft)Flowering period: April and MayHardiness: fully hardyPollination Group: B – flowering mid seasonPretty, pure white, cup-shaped flowers in mid and late spring, followed by sweet, red, dessert apples for harvesting in early October. This robust apple tree produces a heavy crop of fruits with a Cox-like flavour, but a crisper texture and juicy, white flesh. It is ideal for colder areas.Garden care: Keep the base of the tree weed free, fertilise at the beginning of each year and water regularly during hot, dry spells. Remove damaged or crossing branches during the dormant season.Pollination Information: This apple belongs to pollination group B, so you will need need to plant one other different variety of apple to guarantee cross pollination, and a subsequent bumper crop. Ideally this should come from the same pollination group, however it is possible to use one from group A or C as well. Perfect for the Grow Your Own generation! Grow your very own Cauliflowers from seed. Vigorous, quick to maturity, attractive well rounded curd. The leaves are very tasty too! Sharp and modern dining table, with a matte finish stainless steel frame and a rectangular silvery grey glass top. 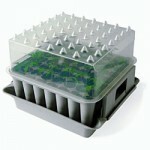 It allows you to sow 49 plants in one easy to use container. Ideal for both greenhouses and windowsills – it’s a pretty neat looking item too! The lid can be turned 90′ which allows air vents to be open or shut. Easy to get plants out of. Use for veg or flowers.